It's time for another amazing sketch over at Atlantic Hearts!! 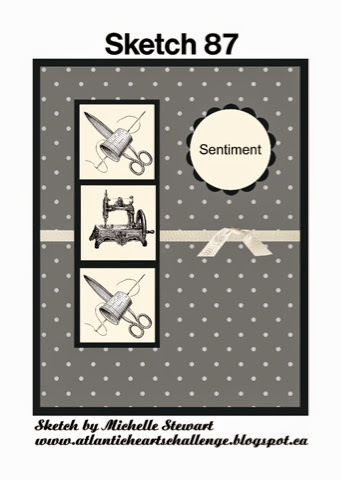 Now, I wanted to work with some of Close To My Heart's new paper from the Seasonal Expressions catalogue. 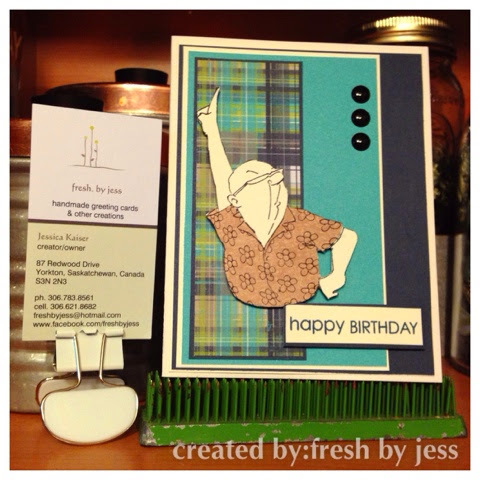 I chose the Heartstrings collection to make my 2 cards (yes, I made 2!). 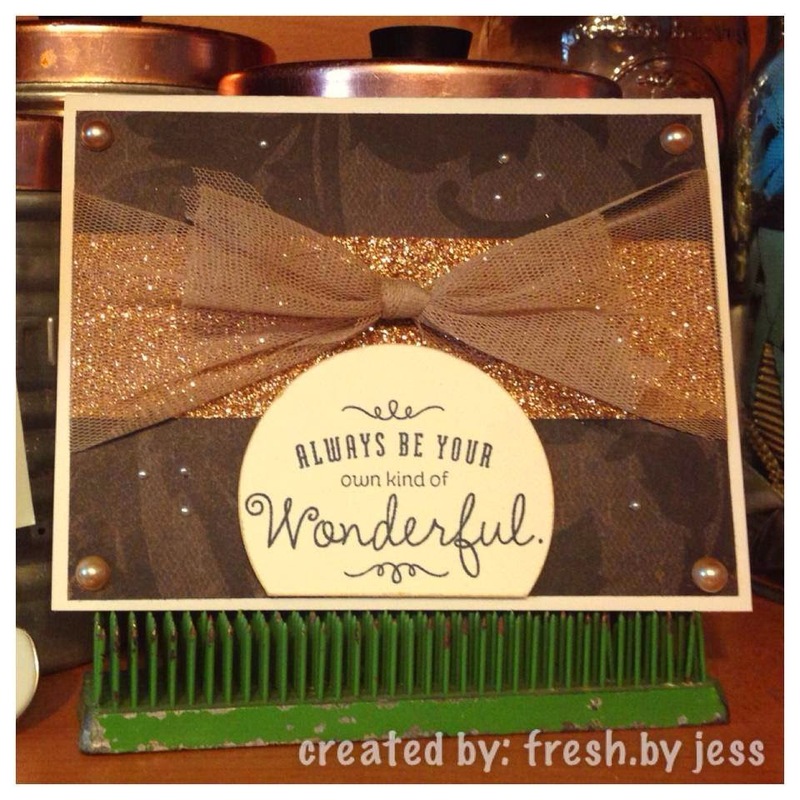 I also used some of the new white shimmer trim and made a cute little bow! The tin pins are super cute and fun to play with too! 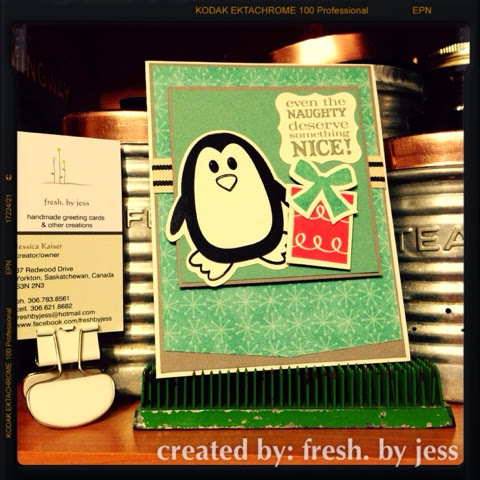 I hope you enjoy and will head over and share your creations with us. 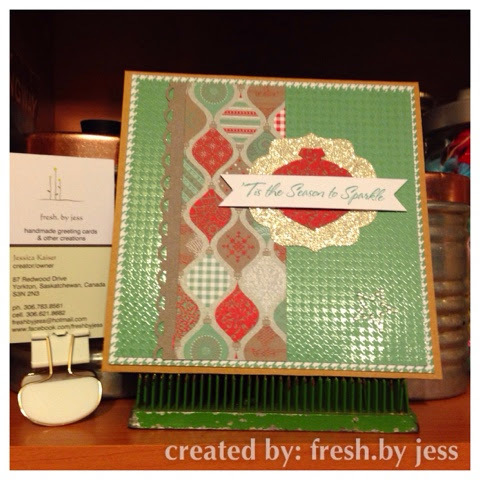 Sparkle N Sprinkle December Challenge! 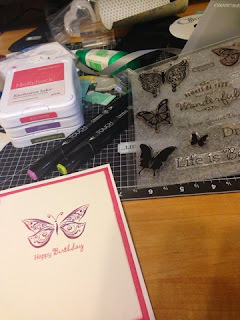 I was soooo excited to be the winner of 4 rubber stamp sets from Sparkle N Sprinkle last month. 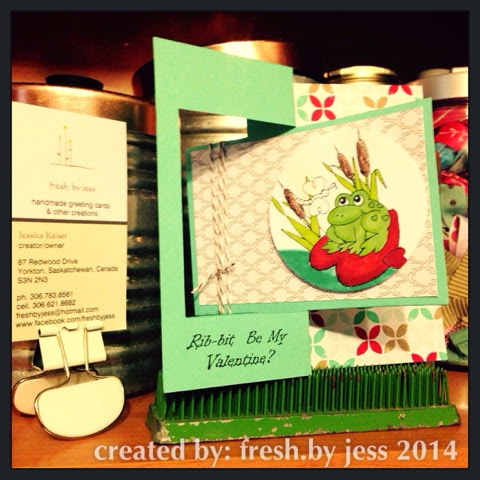 I loved this little frog, so I decided to make a "Flip-it" card with it! 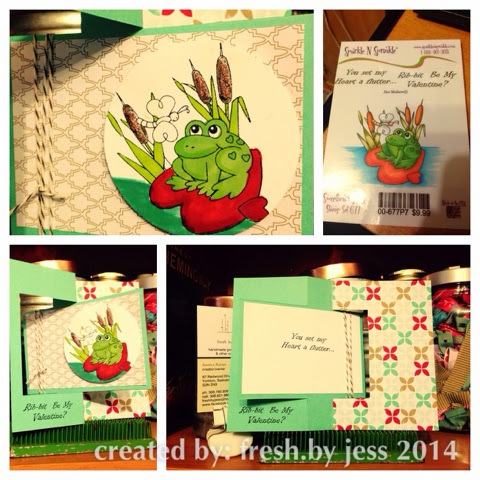 The stamp set is called "Sweeheart Frog". I used an assortment of markers I have on hand to color him and embossed the cattails with Sparkle N Sprinkle's Chocolate Sparkle embossing powder. 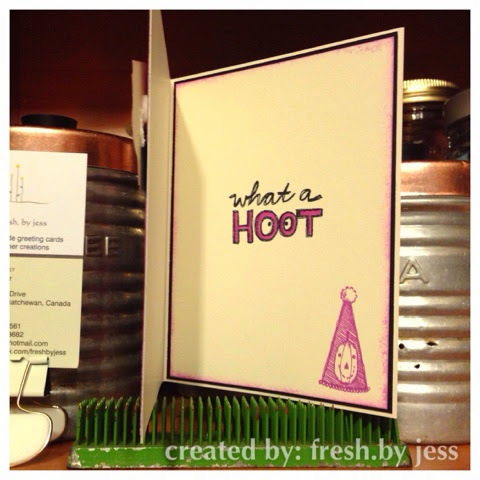 The flip it card cut is from Stephanie Barnard for Sizzix. 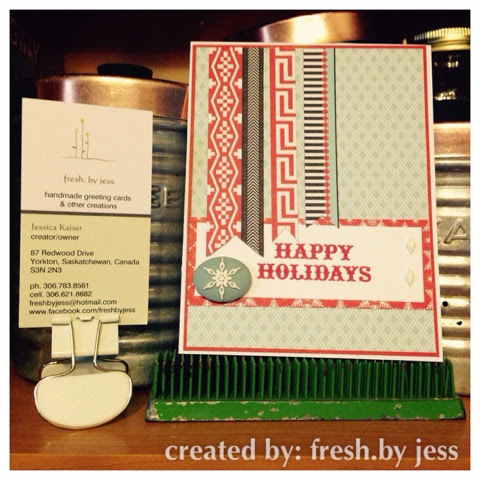 I hope you enjoy this sweet little card! Time for a fun new sketch from Atlantic Hearts! 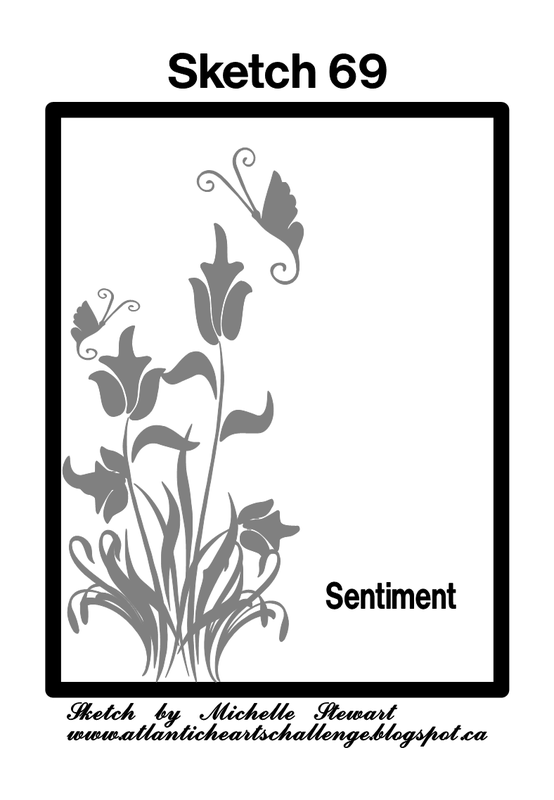 I've been seeing shaker cards popping up all over the place so I tried my hand at making one! I hope you enjoy and go and have fun making yourself a shaker card!! 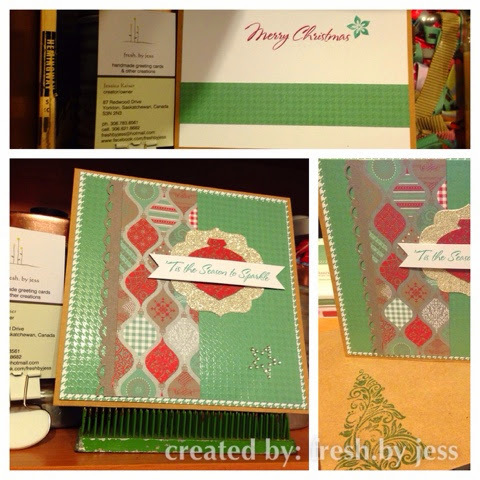 This one used a big variety of supplies fr Close to My Heart (Striped Ribbon, Juniper, Slate, Colonial White paper and Juniper, Slate & Archival Black Ink), Stephanie Bernard for Sizzix (Stamps & Dies),Simon Says Stamp (Lipstick Red Ink), Stampin' Up! 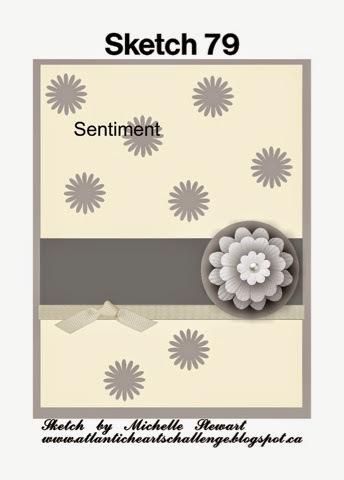 (sentiment and punch) and the snowflake paper was from my stash! 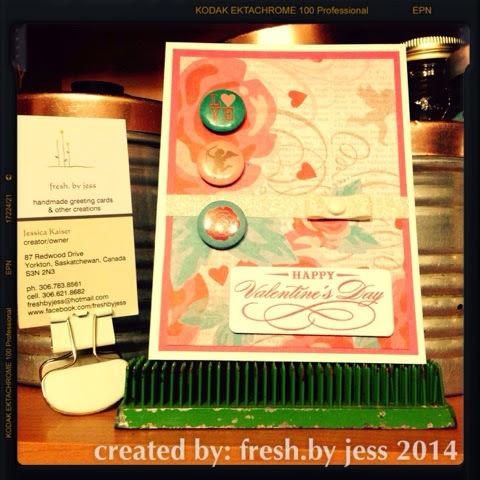 I hope you enjoy my card and I look forward to seeing your creations in the challenge! 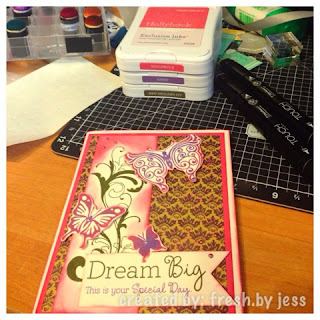 Creative Corner Challenge - Let it Sparkle! 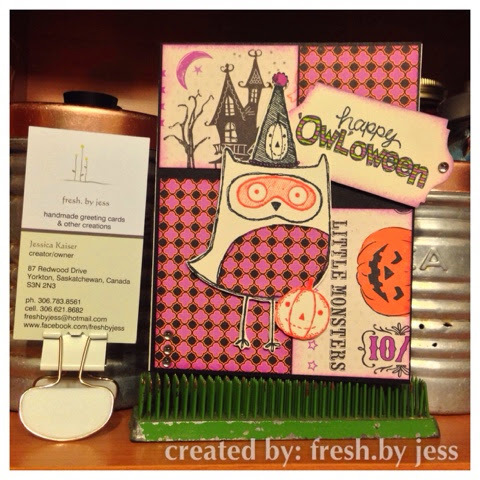 What a fun challenge we have over at Creative Corner Challenges this week! 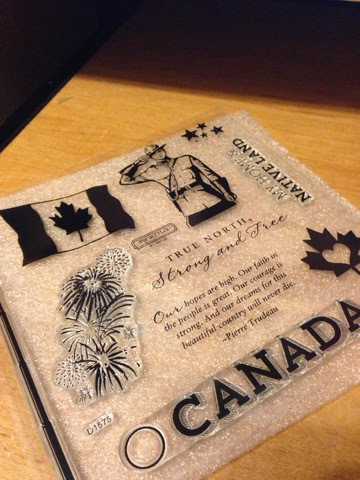 It sure is hard to photograph glitter and embossing details! 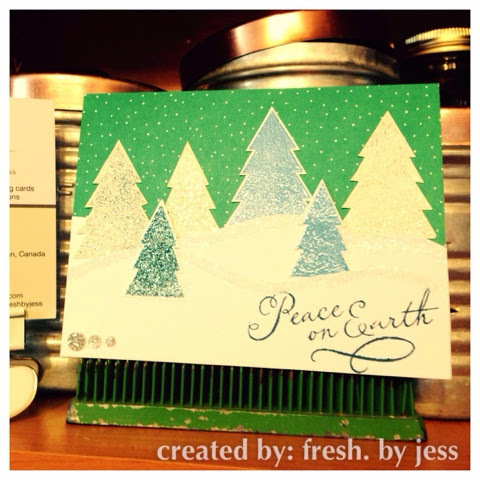 I used Dazzling Diamonds loose glitter, blue loose glitter, blue embossing powder and a tinsel embossing powder on the elements of this card. I think this angle shows the details more. 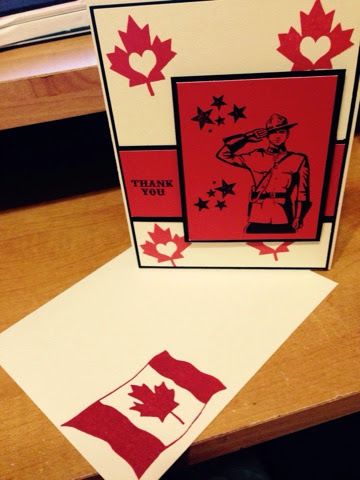 Stamps are from Close to My Heart and Simon Says Stamp. Thanks for stopping by and I hope you will join us this week! 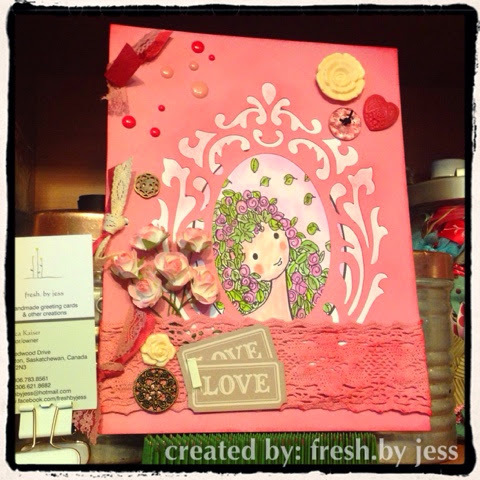 Welcome to Sketch #81 at Atlantic Hearts Sketch Challenge! I hope you will come and play along with us! This week was a rough one for Canadians. The loss of two soldiers was a big deal and I felt called to use this week's sketch to create something to honor those who lost their lives protecting our country. Colors used were Black and Cranberry. 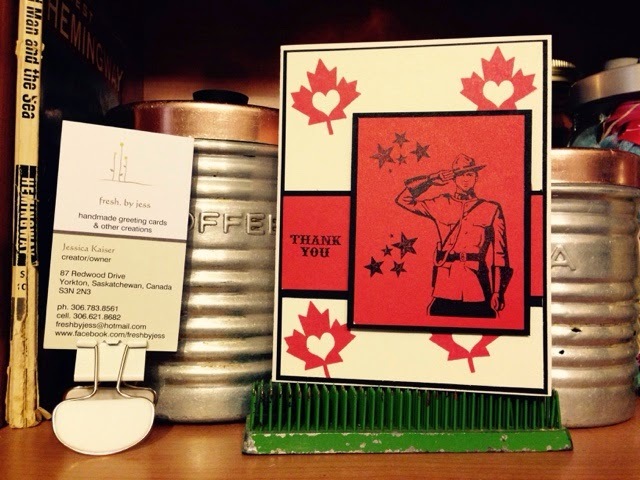 My daughters and I will be dropping this card off at our local RCMP office with some treats this week to thank them for all they do for us! I hope you will come and play along with us this week! It's getting to be that time of year - leaves are falling, colors are changing and the Halloween/Fall Decor starts to appear! 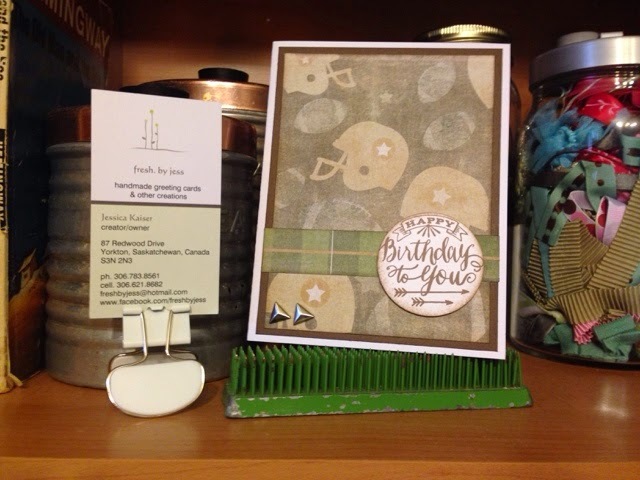 I was feeling a little crafty this morning, so I decided to play around a bit with a frame and the Scaredy Cat Paperpack from Close to My Heart. 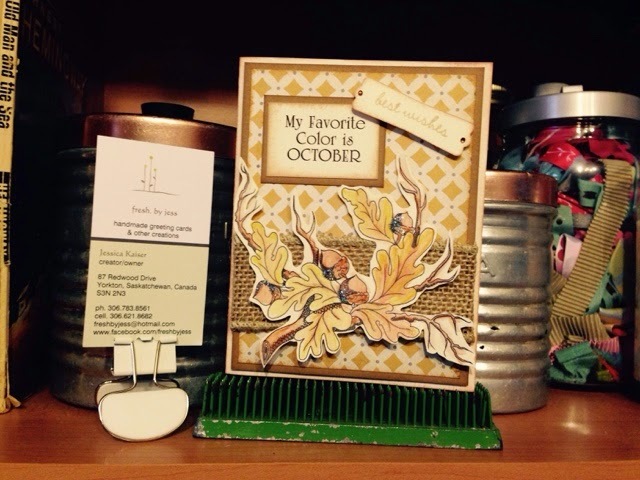 I took a simple frame from the craft store and applied the patterned paper with Bonding Memories glue. Next, I sanded the edges smooth with a sanding block and applied Sunset Ink with a sponge. 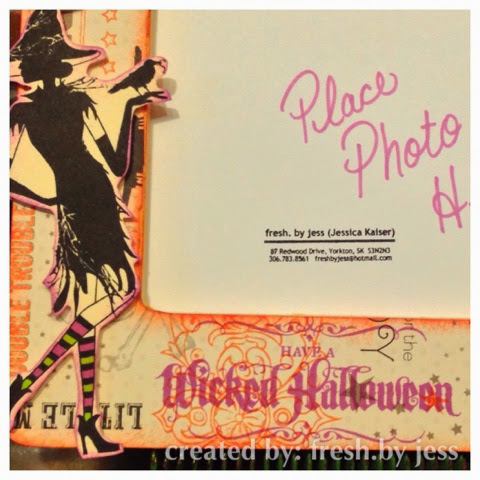 I used a retired stamp set called "Wicked" and stamped the witch, cat and witch hat with Black ink I fussy cut them out and sponged the edges with Thistle ink. Notice on the witch, I colored her socks with our new Twin Touch(TM) Shinhan(TM) markers. 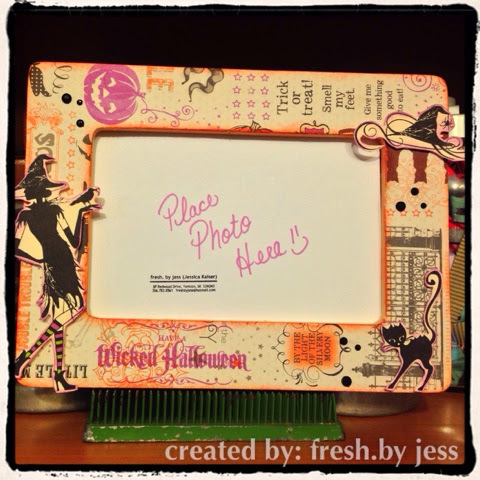 I also stamped "Have a Wicked Halloween" in Thistle ink directly onto the paper covered frame. I finished it off with a few black rhinestones I had in my stash. I think it turned out great! 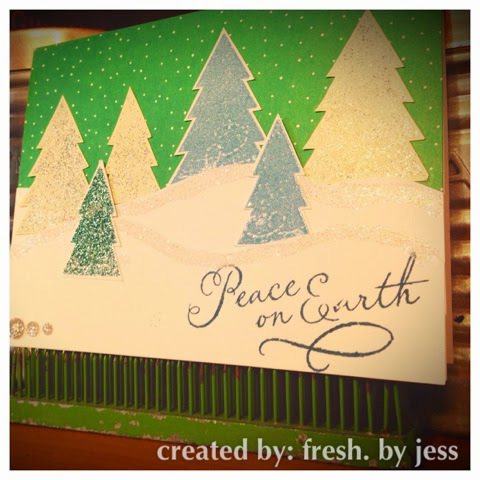 Sparkle n Sprinkle Challenge Card! I decided to take a jump and try my hand at playing with Digi-Stamps! I purchased 2 sets from SparkleNSprinkle and got busy! I colored the image with Watercolor pencils from Close to My Heart. I then added some sparkle on the acorns with some Dazzling Diamonds loose glitter. I sure had fun and can't wait to play around some more! I hope everyone had an amazing Thanksgiving Weekend (well, my Canadian friends anyways!). The turkey is done and it's time to start thinking about the next big holiday - Christmas! 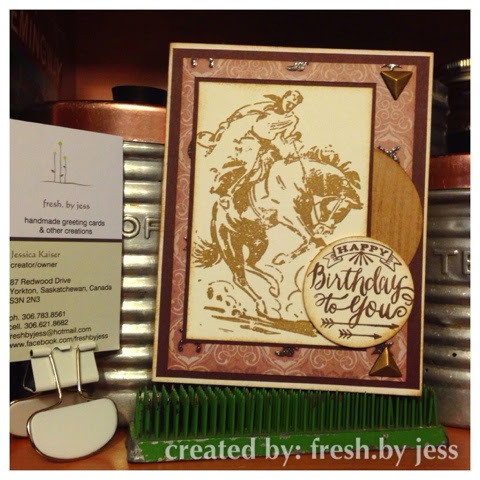 This week's challenge was a great sketch - I am going to use this layout again! 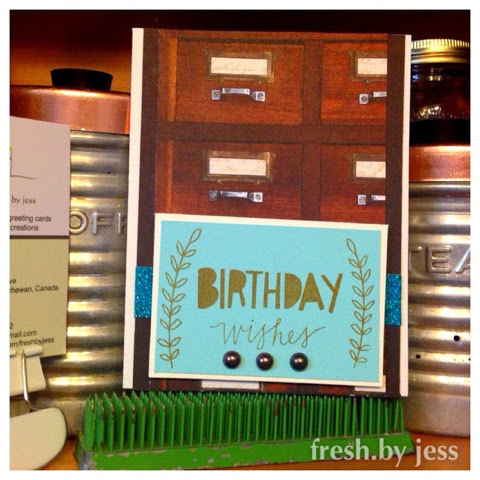 I played with a retired paper pack from Close to My Heart and the new textured cardstock! Colors used were primarily Ruby and Juniper (CTMH). I embellished the inside as well. 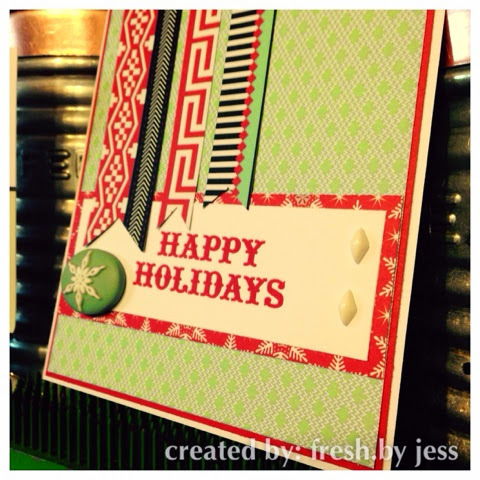 I hope you enjoy this card and will come and play along with us! 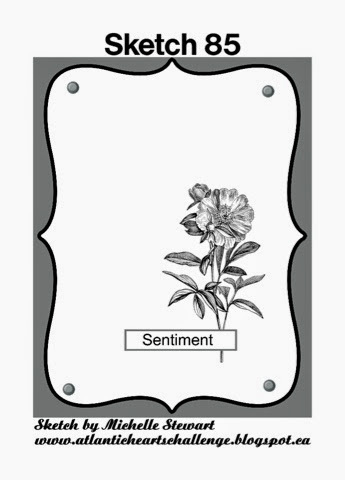 This week we were given a digi-stamp to work with. Coloring is soooo but my strong point, but I gave it my best shot! The theme is "Anything Goes". It's actually a small page cut with the Artbooking Cricut Cartridge from Close to My Heart. I colored the image with various alcohol markers (I have some Copic, some ShinHan and some Close to My Heart and I embellished the page with various things from my stash. I hope you enjoy and will play along! Here we are at Sketch 75!! This week's sketch sure inspired me - I can't wait to do a few more with this layout. 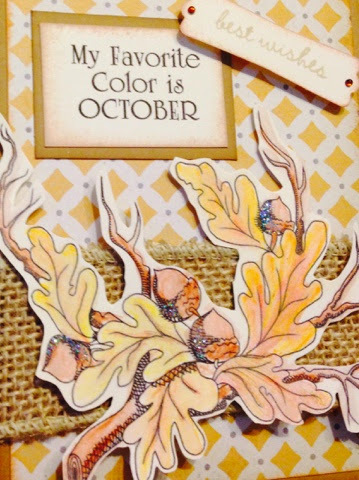 Hope you enjoy and will join us at AHSC and share your creations!! Creative Corner Challenge "Blue & Turquoise"
Somehow this blog post got lost in the "bloggerland" so I will re-post! This week we were given the theme of Blue & Turquoise. 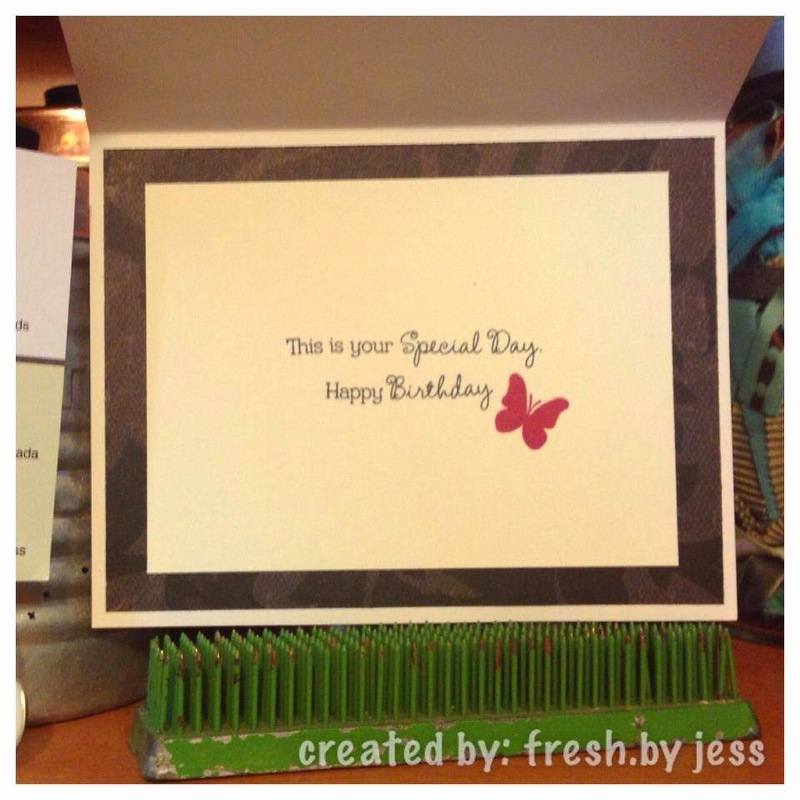 I had a limited amount of time to create, so this was a fast, simple card! 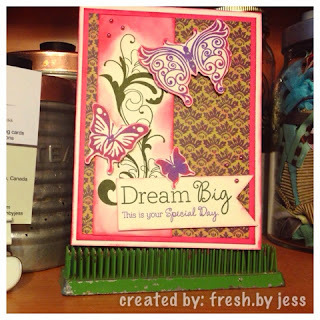 I hope you enjoy and will be back again in 2 weeks with another creation for Creative Corner Challenges! 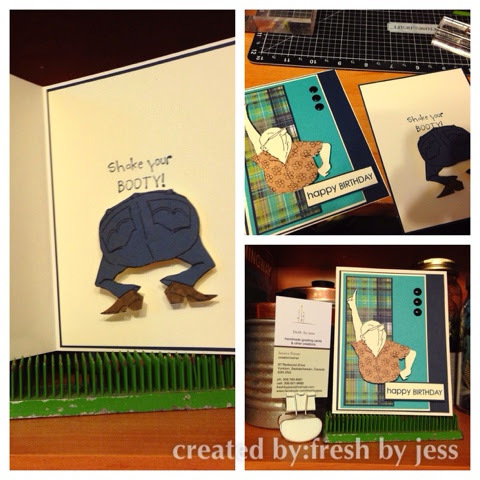 Oh did I have fun making this week's creation for Atlantic Hearts Sketch Challenge! 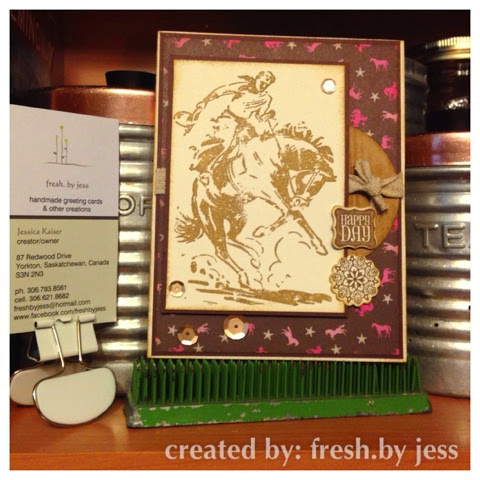 I have been wanting to play with my Tim Holtz "Wild West" stamp set for ages and this sketch seemed perfect! I hope you will come and play along this week! The sketches are always fun! 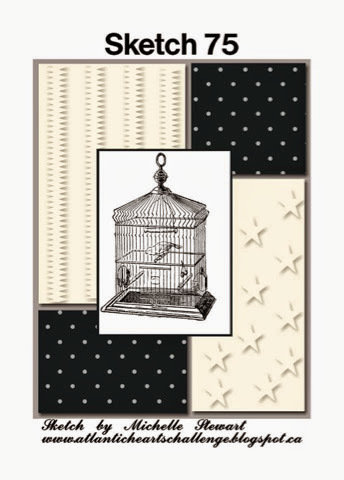 Creative Corner Challenge - Male Theme! I am just here with a quick post. I wanted to share with you my creation for this week. The theme was "male", which a lot of crafters can struggle with. 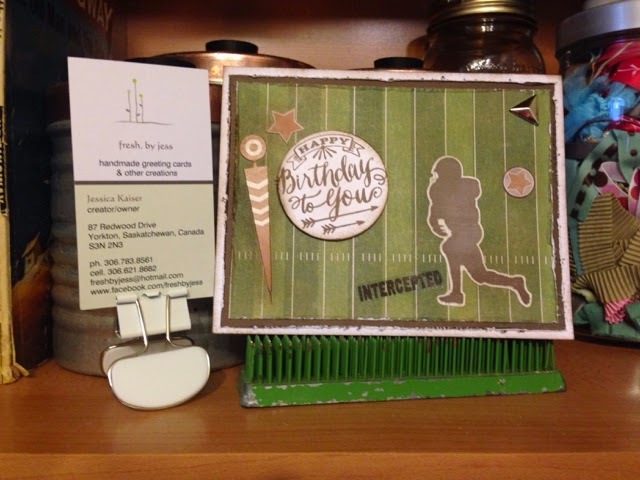 I have been playing with some old Creative Memories paper and came up with some fun "football" cards. 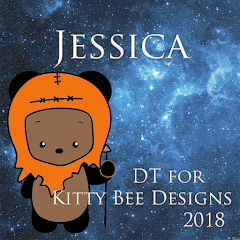 I hope you enjoyed my creations and hope that you come and play along too! I just received some adorable new stamps in the mail a few weeks ago and this week's sketch was perfect for using them!! Yes, it says "Shake your BOOTY" and the "Backside" is mounted on a spring so it shakes!!! Cute heh? I just love it!! Thanks for taking a peek and I hope you come and join us at the challenge! I am soooo excited to announce that I have joined the design team over at Creative Corner Challenges!! I will be providing a creation for them every other week. New challenges are posted every Friday and I hope that you will come and join along with us! 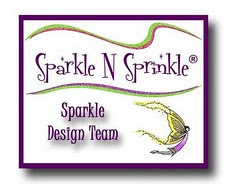 I am really excited to join this team as it is led by my friend Mel B. in Germany! We "met" through a cardmaking group and have become awesome friends ever since. 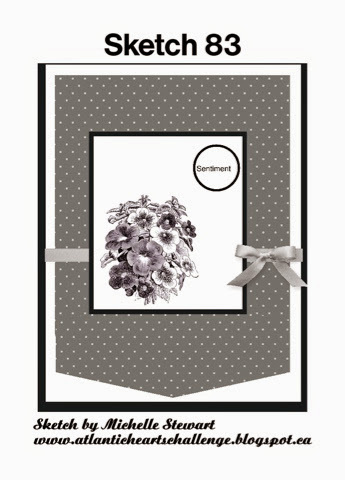 This week's theme was "Girly" - and what screams more "girly" than pearls, lace and GLITTER????? 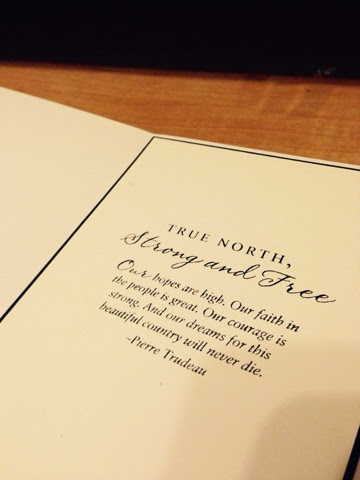 I just love being on this Design Team! 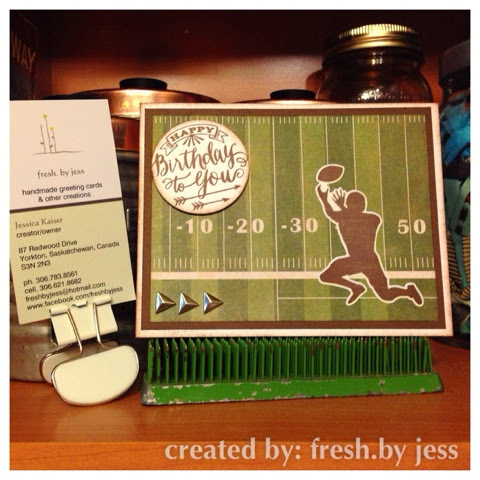 It is really getting me to create on a regular basis (and update my blog too!). 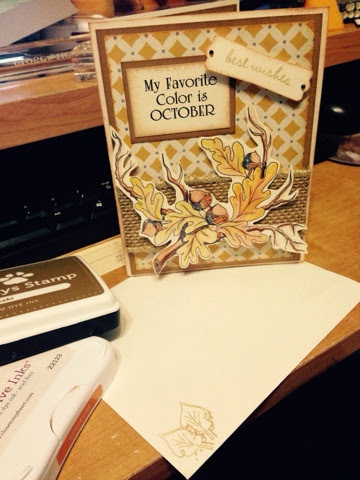 I decided to grab what I had left of Ivy Lane paper to make this card. 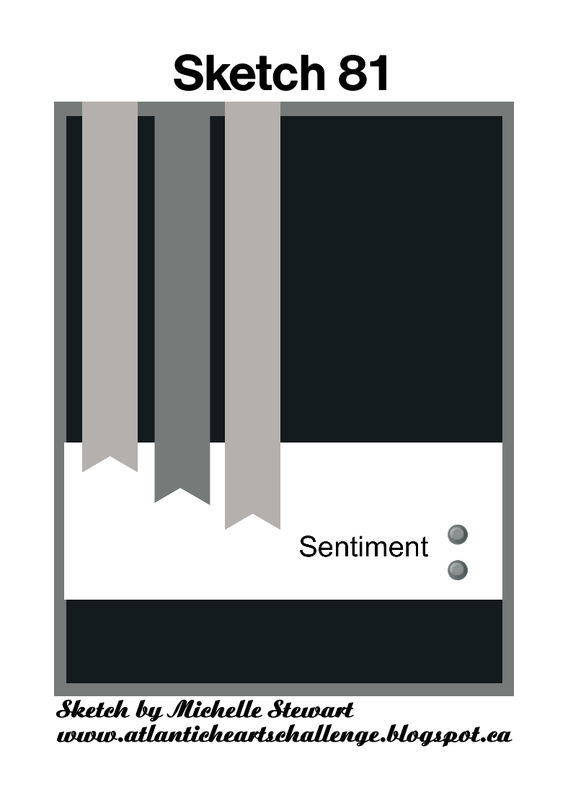 The colors I chose are Hollyhock, Gypsy and New England Ivy. 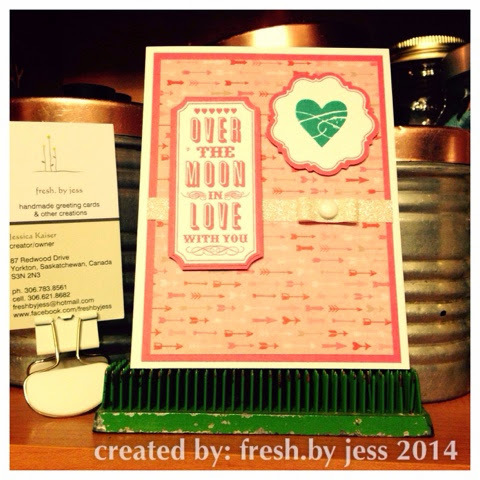 The stamp set is from the new Close to My heart book and is called "Your Own Kiind of Wonderful". 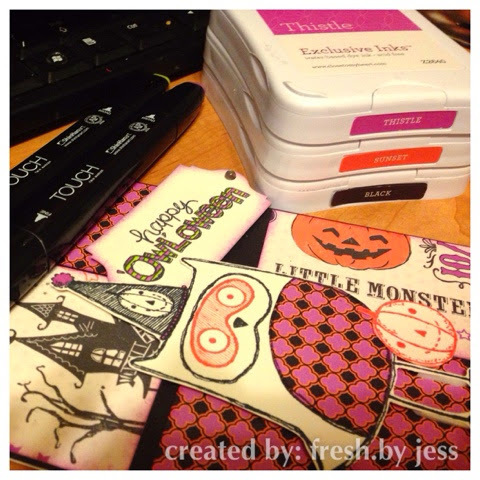 I used our new ShinHan twin touch markers to color some white pearls too! I love that I can buy basic white pearls and color them to whichever color I choose! 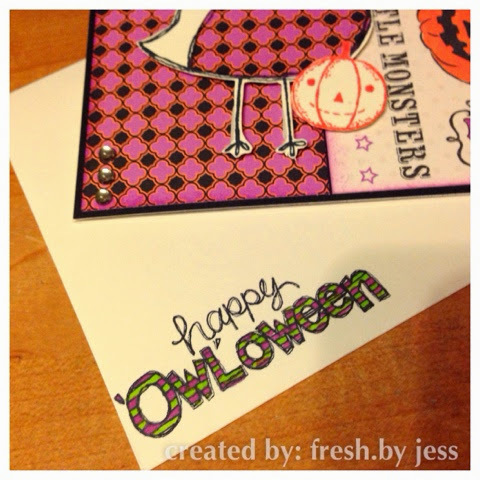 I hope you enjoy this week's creation for Atlantic Hearts Sketch Challenge! I will be back on Thursday with my card for my NEW design team :). (Of course I am staying with AHSC as well!!). Stay tuned!